While you are clearly able to see missed phone calls and messages on the lock screen of Windows Phone 8, judging from the presentations, something like the unofficial homebrew Lock Screen Widgets might be coming as well, this time totally legit. Microsoft has reportedly given developers access to the lock screen, in order to allow displaying of their app notifications there, if needed. The sources said that there will be not one or two, but four options how to display notifications on the lock screen, giving both devs and phone makers the ability to customize the look and feel of their apps and devices further. To determine whether your app is a good candidate for a lock screen presence, you must understand the operation and limitations of the lock screen. A summary of the lock screen is given here. 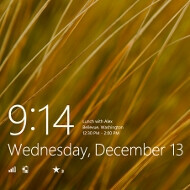 For more information, see the Lock screen overview. A maximum of seven app badges can appear on the lock screen. The badge information reflects the badge information on the app's Start screen tile. The badge (either a glyph or a number) is accompanied by a monochrome icon (logo image) to identify the app the badge is associated with. Only one of those seven apps can occupy a detailed status slot, which allows it to display the text content of the app's most recent tile update. The lock screen's detailed status tile does not show images included in that tile update. The user is in charge of which apps can display information on the lock screen, and which one of those apps can display detailed status. All apps that have a lock screen presence can also run background tasks. All apps that can run background tasks have a lock screen presence. An app cannot use background tasks without also claiming a slot on the lock screen. The notification queue is not supported by the lock screen's detailed status tile. Only the latest update is shown. An app with a lock screen presence, as long as it has set the Toast Capable option to "Yes" in its manifest, displays its received toast notifications on the lock screen when the lock screen is showing. Toast shown on the lock screen is identical to toast shown elsewhere. Tile updates, badge updates, and toast notifications are not specifically designed for or sent to the lock screen. You, as the sender, don't know if the device is currently locked. For an app with a lock screen presence, any notification is reflected both on the Start screen and on the lock screen. It seems pretty silly to me that apps have ro be on the lock screen in order to run in the background. Microsoft should fix that before shipping WP8. Excellent wp8 just getting better and better cant wait for a nokia wp8 produced quad core phone!!! Can't wait for a budget dual-core WP8 phone! cant wait for a budget quadcore lol!